Cheshire report prompts calls for IMO to act decisively. Following the recent Casualty Investigation Report of the fore aboard the "Cheshire" by the Isle of Man Ship Registry, it became clear that the IMO needed to act decisively on its recommendations to change fertiliser classification. The "Cheshire", en route from Norway to Thailand, fully loaded with cargo declared by the shipper as being “Ammonium Nitrate Based Fertilizer (Non-hazardous)” and not liable to self-sustaining decomposition, suffered cargo decomposition that led to rising temperatures in the cargo holds and the generation of toxic gases. The crew had to be evacuated and the vessel was declared a constructive total loss after being salvaged. Ammonium Nitrate Based Fertilizer (non-hazardous) is currently designated in the IMSBC Code as a group C cargo. These are cargoes that that do not liquefy (group A) nor possess chemical hazards (group B). 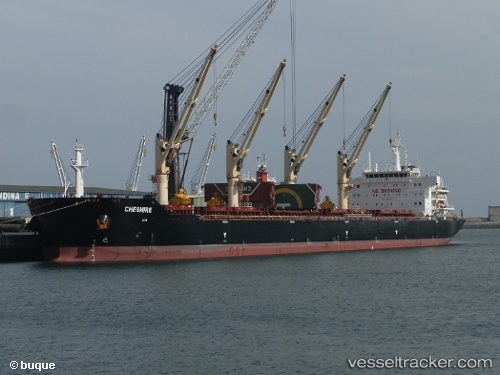 It is clear from this incident that this cargo, or at least some of the ammonium nitrate based fertilizers shipped as this cargo, should not be treated as group C, said Intercargo in a statement. The casualty report made some important recommendations, including amending the misleading cargo name from “ammonium nitrate-based fertiliser (non-hazardous)” to “ammonium nitrate-based fertiliser (not otherwise classified)”, the fertiliser manufacturers to provide further information on the behaviour and carriage of this cargo, and consideration of whether the current IMO-stipulated test for assessment of self-sustaining decomposition properties of an ammonium nitrate-based fertiliser is adequate. Intercargo’s hoped that future work at the IMO will lead to the correct designation and description of this cargo within the IMSBC Code, thus furthering the safer carriage of cargoes and crew. Other recommendations in the report included the provision of specialist equipment onboard the vessel, monitoring of the cargo atmosphere by the crew and the development of cargo and ship specific procedures related to the carriage of this cargo. It was Intercargo’s opinion that these additional precautions, which are being called upon to be the responsibility of the vessel, ought to be unnecessary if the cargo is group C.